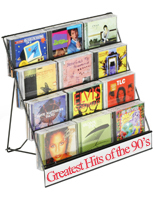 Are CD & DVD displays the answer to your store or business merchandising needs? 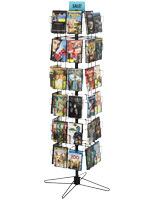 Available in a variety of sizes and styles to match any needs, this type of fixture is ideal for showcasing and organizing a variety of products. 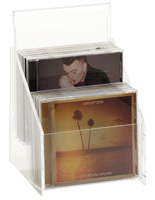 In addition to movies and music, CD & DVD display fixtures are designed to hold items of differing sizes and shapes. 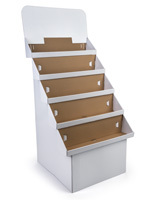 The ultimate goal is to allow customers to easily see what is available, whether by flipping through a countertop selection or spinning a floor rack. 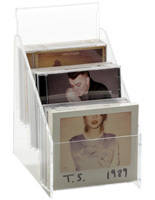 CD & DVD displays, also known as media storage fixtures, are one of the most economical — and versatile — merchandising stands available. 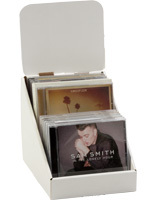 How can businesses use the different styles of CD & DVD holders? 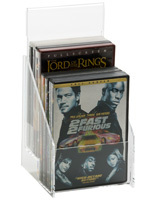 Obviously, CD & DVD displays are ideal for showcasing pre-recorded movies and music. 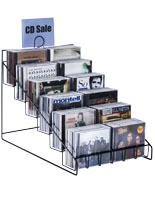 Smaller racks on countertops are ideal to draw attention to sale items, new video releases, Blu-ray discs and special editions, collections or even local artists. 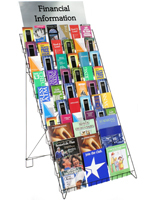 Larger stands can easily hold more than 300 titles at once, allowing customers to browse but not taking up excessive floor space. 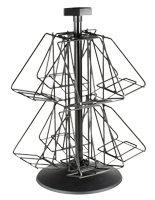 Multiple moveable fixtures can be used in conjunction with built-in or fixed merchandising displays to attract special attention as needed. 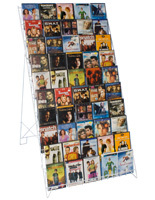 Smaller lightweight racks are also ideal for off-site promotions such as trade shows, conventions, special events, meetings or autograph sessions. 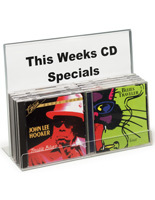 Compact Discs are used for much more than simply storing MP3s or video files. 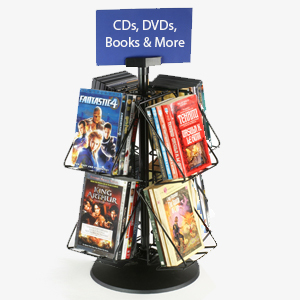 Software programs, special programming and of course blank discs all benefit from being easily visible to store clientele. 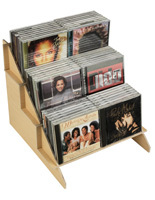 Box-style CD & DVD holders with open pockets are a superior choice for clustering similar merchandise together, while tiered racks allow larger selections to be viewed with ease. Open tiers can be used to group items of different shapes together by theme or style without interrupting browsing flow. 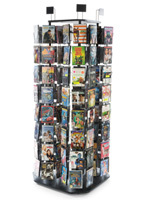 Video Games & Software: DVD or compact disc size displays make it easy to promote both new releases of popular programs and also store base inventory selections. 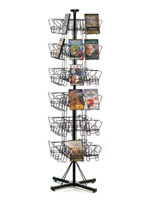 Customers browsing the newest version of their favorite game or the latest software in a counter display may easily choose to explore similar programming shown nearby in a spinning rack. 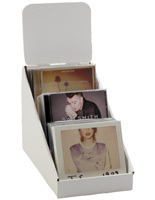 Older versions, sale items and remainders can be placed in small inexpensive stands as POS impulse items. 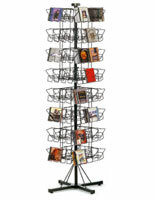 Books & Other Merchandise: These versatile racks can hold a wide variety of items. 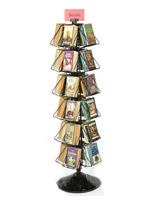 Media tie-in books are frequently tied to software to video games, special editions such as Blu-ray or boxed sets and more, in addition to "regular" book sections. 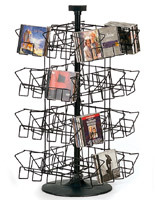 Many smaller items, such as greeting cards, note pads, even calendars and date books, will also fit into these versatile racks. 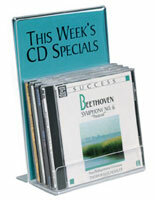 Multi-media displays refer to much more than interactive sales programming. 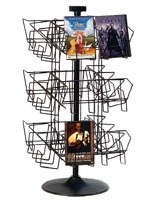 Our versatile, and inexpensive, merchandising racks can handle a variety of items in various sizes, shapes and packaging styles. 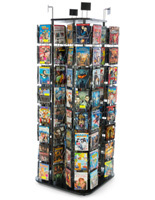 Books, video, Blu-ray, music CDs and more can all be easily accommodated in sets or grouped together in our huge selection of rack configurations.